I spent a large part of the last two years driving, and an occasionally boating, along Australian rivers trying to understand our waterways for a book commissioned by the National Library of Australia. They asked for 10 rivers. In the end I explored nine and a river system – the Channel Country of central Queensland – in order to say something about our understated relationship to waterways of this country. I knew little about rivers when I started and quite a bit more at the end. But, as is often the case, the more you know about something the more you realise how much you don’t. Australia’s rivers and creeks are complex; often dry, sometimes in flood, little like the perennial waterways of Britain and Europe well fed by rain and snow. They confounded the newcomers who colonised the land through the 19th century but were understood by the hundreds of Aboriginal groups who had established territories around these ribbons of life-giving water over thousands of years. I found one of the most poignant accounts of the European sensibility in Jill Ker Conway’s much-loved memoir The Road from Coorain, a story which begins on the author’s family pastoral property in far western New South Wales. Conway recalled the ‘magical’ transformation of the creek beds when the rains came: ‘Bull rushes shot up beside watercourses and the suddenly there were waterfowl round about… Trees sprang up as the waters receded around our house’. (p.32) The transformation suddenly made it clear why the first people there built their earthen ovens where they did. Norman Tindale's 1940 map of 'Aboriginal Tribes' shows this as Barindji land. Over millennia they had learned the lines of non-perennial creeks and useful waterholes, and consequently where the animals and edible plants would be found. For Conway it was a revelation. 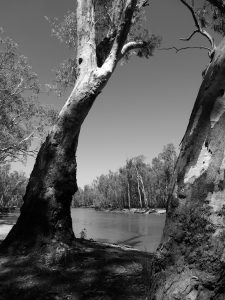 The converse of the interloper’s imagination - that inside knowledge of Aboriginal people – is expressed in Alexis Wright’s novel Carpentaria, set around a fictitious but plausible river in Australia’s far north Gulf country: ‘It takes a particular kind of knowledge to go with the river, whatever its mood’, she writes, ‘It is about there being no difference between you and the movement of water as it seasonally shifts its tracks according to its own mood.’ The usurpers couldn’t read those moods and built a town on the river banks, tellingly named Desperance. The river destroyed it, ‘just like that’. (p.3) It made me think of Gundagai, wiped out by the Murrumbidgee River in 1852. My first stream was the Clarence which floods but never runs dry, at least in its lower reaches. 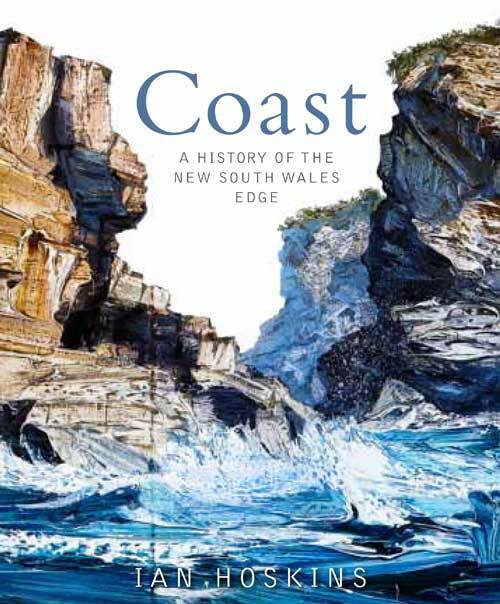 This was the proverbial ‘big river’ of colonial accounts, a waterway that most resembles those big streams of immigrant memories; the biggest on the Australian east coast. Paddle steamers easily splashed up and down it from the earliest years of white occupation, first in search of the beautiful Red cedar (Toona ciliata), then to take up land for cattle and cane; sugar was easily planted on the wide river flats. Therein lies a lesson in the significance of topography for understanding history. In the process the great tangled well-watered forests and marshes that had sustained the Bundjalung, Gumbaingirr and Yaegl people for generations were cleared and drained. For 40 kilometres or so the river is an estuary – what the geographer Colin Woodroffe has evocatively described as a ‘tongue of the sea reaching inland’. Sharks, dolphins, eels, prawns other marine creatures all move backwards and forwards along the ‘tongue’ between river and ocean. An estuary is always a transitional place. And that gave me the theme for the Clarence chapter. 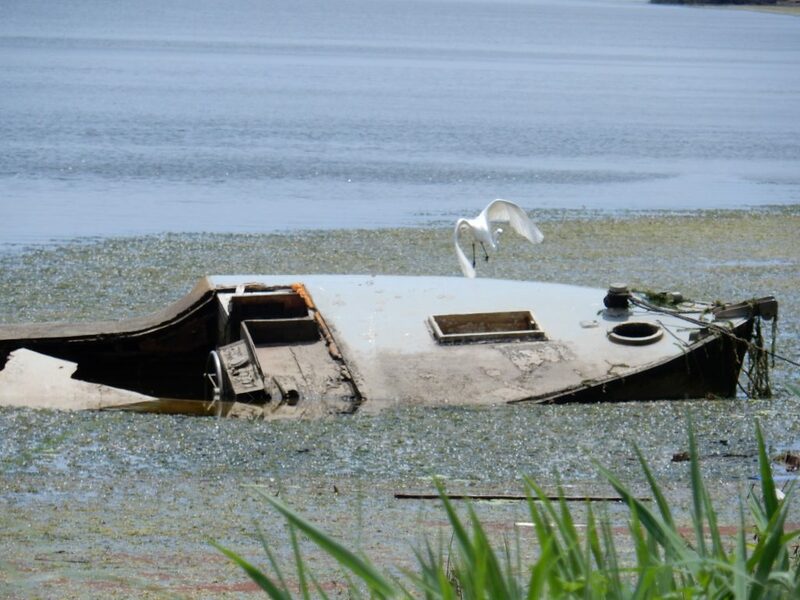 Shifts both ecological and cultural have been so much a part of the history of the waterway. The shift from Aboriginal to European occupation is an obvious example of the latter; a transition of course brought about the force of colonial power rather than negotiation or treaty, as was the case across the country. The transformation of the ecology of the riverfront is obvious to anyone who has seen photographs of the pre-colonial forests around the Clarence. The historian Alfred Crosby famously coined the term ‘ecological imperialism’ to describe the transfer of plants and animals across the globe as Europeans colonised lands far and wide. Beautiful though they may be, the pastures and farm animals around the Clarence River are also manifestations of ecological imperialism. The story of prawn fishing throws up another less obvious example of the link between social shift and ecological change. The Clarence is home to the largest fishing fleet on the north coast of New South Wales. Those vessels that trawl for prawns do so in the river and outside the heads. Their quarry are the school and king prawns. The local catch is high quality and commands good prices locally and in the insatiable Sydney market. And so it should – though it may sting the pocket on occasion I take solace in paying a real price – in this case for a wild resource that is sustainably managed. 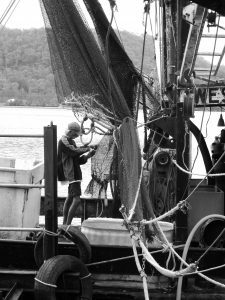 Fishing represents the last wild harvest in modern societies; because it is only in the sea that large numbers of un-farmed animals survive to be caught. But there is a threat to this wild catch in the Clarence – white spot disease. The source is cheap uncooked prawns imported from Asian farms, intended for human consumption but used as bait by recreational fishers. Infected raw prawns had a dramatic effect on the prawn farms of Queensland. Commercial fishers around the Clarence watch nervously for signs of the disease in wild stocks there. Recreational anglers are being implored not to use the green prawns as bait and fines have been introduced if they are cast near river prawn farms. The competing interests of prawn farmers, wild fishers and recreational fishers are real and I suspect not altogether reconcilable. The estuarine tides of the Clarence are more than ever part of a global flow of organisms. I hope the information campaign works for the sake of the prawn fishers and the Clarence itself. My book comes out next year.